Cats are wonderful companions, but if we don’t take care of all of their needs, they can also be very destructive little creatures. For instance, cats need to scratch at things in order to keep their claws trim and sharp. If you do not provide them with something that is specifically for this purpose, chances are that you are going to end up with a lot of destroyed furniture, shoes, clothing, and many other items. All you need to do in order to prevent this from happening is to get your cat a good scratcher and train them to use it. There are several different types of cat scratchers available, and today, we are going to take a look at the PetFusion 3-Sided Vertical Cat Scratcher and Post, which is available in two sizes. If you could provide a scratcher, a play area, a nap area, and more for your cat, it would save a lot of things around your home, and a lot of frustration on your part. This scratcher is so much more than just a scratcher. 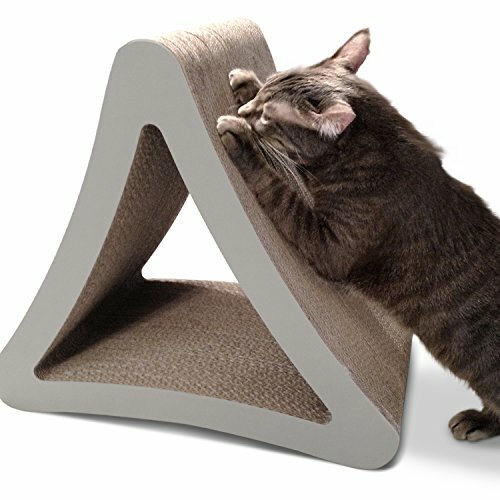 This scratcher is designed so cats can get a full horizontal stretch, as well as sharpen and trim their claws. There is a cubby hole where they can play, explore, and nap as well. 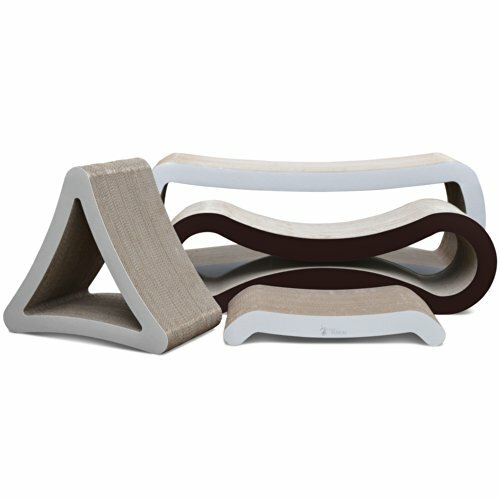 The curves allow cats to stretch and scratch at a variety of angles. They can keep their claws healthy, get exercise, and enjoy nap times with this scratcher. If you live in a small space, such as an apartment or a tiny house, this scratcher is ideal, because it is so small. It measures just 18 X 10.5 X 16 inches, so it can easily be placed behind furniture. It can be rotated for six times the normal use, which is going to make it last longer than other cat scratchers made from similar materials. If there are any manufacturer defects, or if you are not completely satisfied with this cat scratcher, you can return it for a full refund. PetFusion offers a six-month warranty on all of their products. You can contact customer service by email or telephone with any concerns or questions that you may have. Some cat scratchers made from cardboard are poorly built, so they end up falling apart within a couple of months. 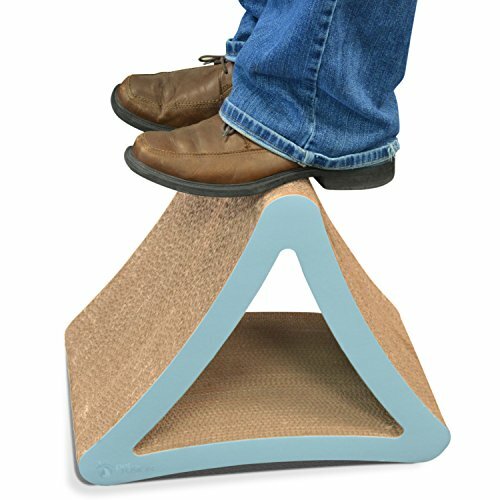 The PetFusion 3-Sided Vertical Cat Scratcher and Post is made differently, with each piece being separately glued together so the unit is more durable. You can expect this scratcher to last for at least a year. One of the things customers like best about this product is the fact that they don’t have to assemble it themselves. It comes completely pre-assembled, and all of the materials used have been tested to ensure that they comply with international safety standards for pet products. Every product has its good and bad points. We have talked about a lot of the things that people (and cats) really like about the PetFusion 3-Sided Vertical Cat Scratcher and Post. Now it is time to look at some of the negatives. Here are the pros and cons you should consider before buying this cat scratcher. This cat scratcher is made with recycled cardboard, and it is put together using non-toxic glue. It is made in a neutral color, so it will look good in any room in your home, no matter what the color scheme is. With three different surfaces and six different ways that this cat scratcher can be used, your cat is never going to get bored with it. When they tire out, they can crawl inside and have a snug place to curl up for a nap. Priced at less than $40, you will be hard pressed to find another cat scratcher of this quality at such a great deal. Yes, it is made from cardboard, but this doesn’t mean that it isn’t sturdy and that it isn’t going to hold up for at least a year. 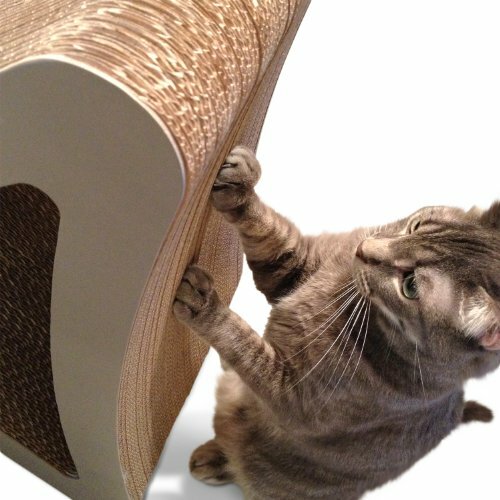 Just because this isn’t a tall scratcher, it doesn’t mean that your cat won’t be able to stretch out with it. The shape allows for a good horizontal stretch, so they will be able to stretch all of their muscles while sharpening and trimming their claws. This cat scratcher shreds easily. So, you will need to keep a broom handy in order to clean up the messes left behind every time your cat uses it. Unfortunately, the fact that it rips easily means that it isn’t going to last as long as other scratchers that are not made from cardboard. In some cases, products have arrived damaged. This is not a manufacturer defect, but a problem that happens during shipping due to the fact that the cardboard used to make the scratcher can be bent. Some cats may not like this scratcher due to its odd shape. If you get one and your cat doesn’t like it, don’t despair. It may be that all your cat needs is a little extra incentive to use it, such as some catnip sprinkled inside, or liquid catnip sprayed all over the unit. All in all, if you are looking for a cat scratcher that is going to save your furniture by giving your cat something else to scratch on, and you don’t want to spend a lot of money, the PetFusion 3-Sided Vertical Cat Scratching Post is an excellent option. It is made with lightweight materials, and it is small enough to place in any room without being in the way. Most cats seem to love the unique shape because they can stretch, scratch, and even snuggle in for a nap. It will hold up for several months before you need to replace it, so you are also getting some value for your money.